A Colorado mother who attempted to teach her daughter a lesson about Facebook use wound up getting blasted by others. In an effort to show her daughter how quickly something can spread online, Kira Hudson posted a public photo of the young girl and asked her Facebook friends to share it, WHNT reports. 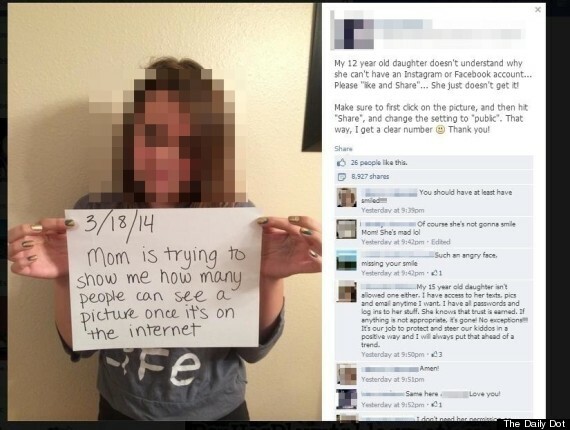 She had the girl pose with a sign that read, "3/18/14: Mom is trying to show me how many people can see a picture once it's on the internet." In a screenshot of the post, obtained by the Daily Dot, Hudson explained, "My 12-year-old daughter doesn't understand why she can't have an Instagram or Facebook account... Please 'like and Share' ... She just doesn't get it!" 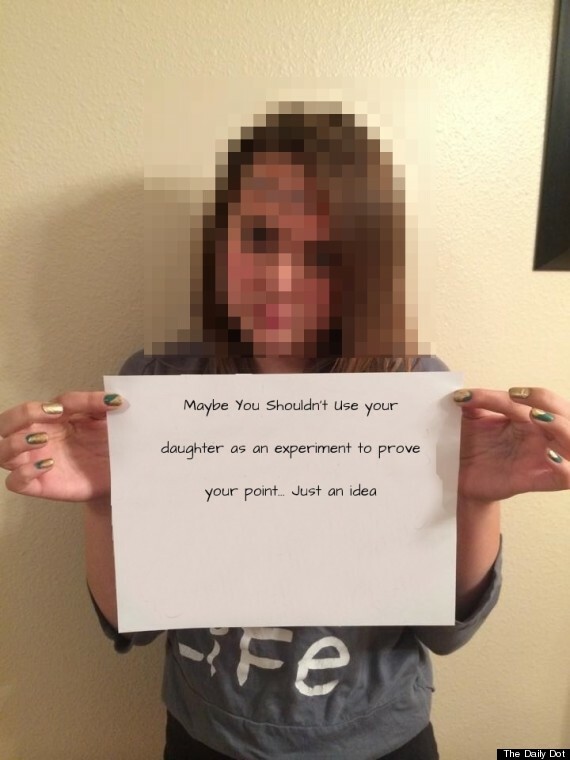 But Hudson probably didn't expect the photo of her daughter to wind up on 4chan, an image-based bulletin board. Users on the random imageboard /b/ eventually found Hudson's Facebook page, home address and phone number, according to the Daily Dot. On Wednesday, the mother received prank calls, and pizzas were delivered to her house. Some also edited the original photo to include an obscene message. Hudson eventually removed the photo, which had almost 1 million likes. These sorts of posts might get a lot of attention on social media, but parenting experts do not recommend jumping on the public humiliation bandwagon. Alfie Kohn, author of Unconditional Parenting: Moving from Rewards and Punishments to Love and Reason, previously told The Huffington Post public shaming is "counterproductive" and will "never achieve any result beyond temporary compliance, and it does so at a disturbing cost." A child is likely to view the parent as an "enforcer" versus an "ally," Kohn added. It could also make the child believe "the reason not to steal (or lie or hurt people) isn't because of how it affects others but because of the consequence you, yourself, will face if you're caught." Still, teaching children about Internet safety is a vital lesson nowadays. Last year, fifth-grade teacher Julie Culp wanted to show her students a photo can be seen by many people online. So she took a selfie with a sign and asked people to like the snapshot. The image garnered hundreds of thousands of likes. I am very grateful to all of the parents who have messaged my daughter and me, letting us know that because of our “experiment,” they were able to teach their own children more about Internet safety. This was one lesson that both my daughter and I learned very quickly! I had not anticipated it gaining momentum as fast as it did. It certainly opened my eyes to the fact that I thought my own private Facebook was secure. It was not as secure as I thought. Luckily for us, the information that was gathered by others was not my current residence or phone number. I would like to apologize to the family who is living at our old address and let them know that I hope this hasn’t caused them much distress and the next pizza will be a gift from me. This whole thing has really proven the point, and I am hopeful that even though there have been a few bumps, others can continue to learn from our experience.